HINCHINBROOK (AUS) (Bay 2007-Stud 2011). 2 wins at 2, AJC Skyline S., Gr.3. Leading Aust. First Season Sire 2014-15. Sire of 269 rnrs, 171 wnrs, 14 SW, inc. Press Statement (BRC JJ Atkins S., Gr.1), Seabrook, Whispering Brook, Derryn, Diamond Tathagata, Beat the Clock, Salsonic, Samara Dancer, Spright, Flippant, Flying Jess, Improvise, Manaya, The Virginian, SP Problem Solver, Wild Heart, Knowable, Super Too, Brazen, Brooklyn, Old Trieste, etc. Fox Tales (g. by Foxwedge). 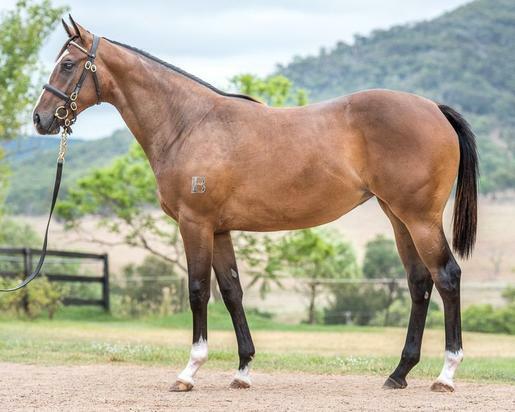 5 wins-1 at 2-at 1000m, 1200m, A$116,285, to 2017-18, 3d ATC Theraces H.
Angel Lass (f. by Hinchinbrook). See below. Winter Sweet. Winner at 1400m in Aust. Roy Royal Roy. Winner at 1600m in South Africa. Angel of Avalon. Winner. See above. Oppose. Placed at 3 in 2016-17 in Aust. TEJANO'S OASIS (Tejano Run). 7 wins-2 at 2-from 5f to 8¼f, Prairie Meadows Iowa Breeders' Oaks, L, 2d Prairie Meadows Iowa Sorority S., L, 3d Prairie Meadows Bob Bryant S., L, Prairie Meadows Debutante S., L. Producer. SUNRISEONTHEOASIS (Gilded Time). 6 wins. See above. Cycloneontheoasis (Bravo Bull). 3 wins-1 at 2-to 6f, 3d Prairie Meadows Gray's Lake S., L.
Royal Chalice. 6 wins to 7½f in U.S.A.
Margarita Real. 2 wins at 4f, 5½f in U.S.A. Midnight Moment. 2 wins at 5½f, 6f in U.S.A.
C.U. at Midnight. Placed at 2 in U.S.A.
Midnightontheoasis (Gulch). 2 wins. See above. Canadian Maple. Winner at 1600m, HKJC Lion Rock H., 3d HKJC Jackson H.
AFLEET BUCK (Bucksplasher). 17 wins-1 at 2-from 6f to 8½f, US$437,012, Canterbury Park Derby, L, 3d Fairmount Park Pete Condellone Memorial H., L, 4th Fairmount Park Circle C Classic H., L.
TITLE CONTENDER (Pulpit). 7 wins-1 at 2-from 6½f to 9f, US$343,153, Thistledown Ohio Derby, Gr.3, Hastings Park British Columbia Derby, Gr.3, Sir Winston Churchill H., L, George Royal S., L, David Forster Hall of Fame S., 2d Hastings Park British Columbia Premier's H., Gr.3, Lieutenant Governors' H., L, John Longden 6000 S., L-twice, George Royal S., L.
MOONLIT GARDEN (Malibu Moon). 3 wins from 8¼f to 9f in 2018, Saratoga Summer Colony S., L, Keeneland Allowance, 2d Monmouth Lady's Secret S., L.
Matterhorn (Tapit). 5 wins-1 at 2-from 7f to 9f, US$351,633, Belmont Allowance, 3d Monmouth Philip H Iselin S., Gr.3, 4th Belmont Peter Pan S., Gr.2. Tamazunchale. 5 wins-2 at 2-from 1100m to 1600m to 2018 in U.S.A. and Mexico, Las Americas Stakes Jockey Club Mexicano, Clasico Roberto A Ruiz, 3d Las Americas Futurity Mexicano. Diva. 5 wins-1 at 2-from 1100m to 1600m in Mexico, Las Americas Clasico Monarca, 3d Las Americas Handicap de Las Estrellas. Producer. Strawberry Day. 4 wins-1 at 2-from 1100m to 1700m in Mexico, Las Americas Clasico Criadores Mexicanos (Potrancas), 2d Las Americas Clasico Nueva Sangre. Chico Fresa. 4 wins-2 at 2-from 1100m to 1900m in Mexico, Las Americas Derby Mexicano, 2d Las Americas Clasico Nueva Sangre, Clasico Dia de la Bandera, 3d Las Americas Handicap de Las Americas, Clasico Criadores Mexicanos, Stakes Jockey Club Mexicano. PHOENIX FACTOR (Briartic). 5 wins. See above. Race Record: 1 Starts 0-0-1 A$1,760.